The universally acclaimed smash that NPR calls "the best show of the year!" Winner of four Tony Awards including Best Musical Revival, director Jerry Zaks' "gorgeous" new production (Vogue) is "making people crazy happy!" (The Washington Post). 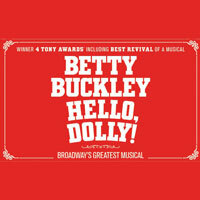 Breaking box office records week after week and receiving thunderous raves on Broadway, this HELLO, DOLLY! pays tribute to the original work of legendary director/choreographer Gower Champion - hailed both then and now as one of the greatest stagings in musical theater history. Rolling Stone calls it "a must-see event. A musical comedy dream. If you're lucky enough to score a ticket, you'll be seeing something historic. Wow, wow, wow, indeed!" "...The national tour of director Jerry Zaks' exuberantly received revival of "Hello, Dolly!" has finally reached the Hollywood Pantages Theatre. And though it brings us neither Bette Midler, who won a Tony Award for the title role in 2017, nor Bernadette Peters, who replaced Midler on Broadway to equally warm praise, this show cannot be accused of shortchanging us on star power." "...Yet the show remains indomitably jubilant because Dolly exists to make life flourish, not fester, and her chosen fertilizers are money and matchmaking. This nurturing Earth Mother gardens people and they thrive. And while I thought that the cast - which enunciated beautifully so that we heard every lyric - was a bit pushy and overmiked, their delight on stage was palpable in the house." "...Betty Buckley is making matches right and left while earning ovation after ovation as only a Broadway legend can in the 10-Tony-award-winning 1964 classic Hello, Dolly!, now paying L.A. a three-week visit to Hollywood's Pantages."